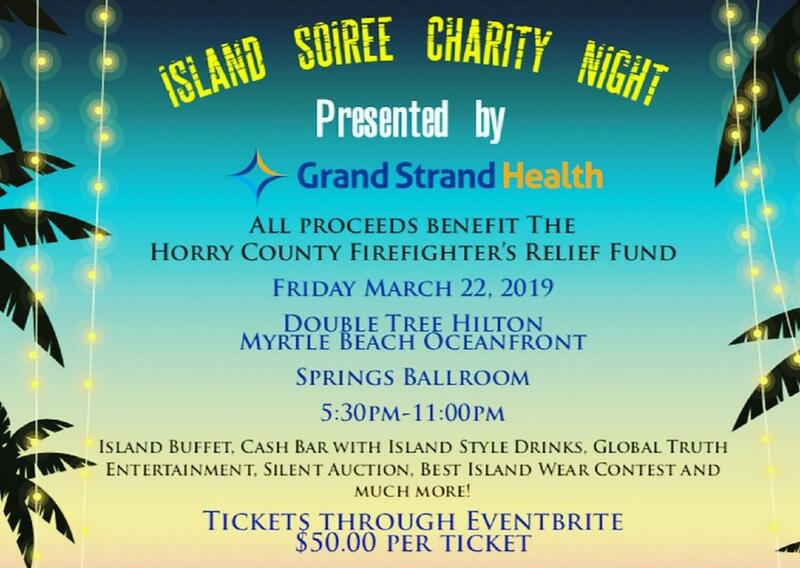 The Horry County Firefighter’s Relief Fund (HCFFRF) will be hosting an Island Soiree Night at the beautiful Double Tree by Hilton Myrtle Beach Ocean Front Resort on March 22, 2019. The presenting sponsor for our event is Grand Strand Health. This evening will offer a night of Island style fun with Island themed buffet, specialty drinks and dancing, frivolity with friends old and new, and a celebration of community all to benefit our local Fire & EMS personnel right here in Horry County. The event will be held in the Springs Ballroom with doors opening at 5:30 p.m. and starting off with a cocktail hour on the ocean front balcony and silent action before an Island Style Buffet Feast. Global Truth Entertainment will provide us with music and dancing until late in the evening. There will be lots of fun extras such as raffles, a photo booth and giveaways throughout the night. All proceeds from the evening will benefit the Horry County Firefighter’s Relief Fund. Tickets on sale now! If you would like to Sponsor or Donate to our silent auction click the links below! Also be sure to keep up to date with our upcoming events on our Facebook page.